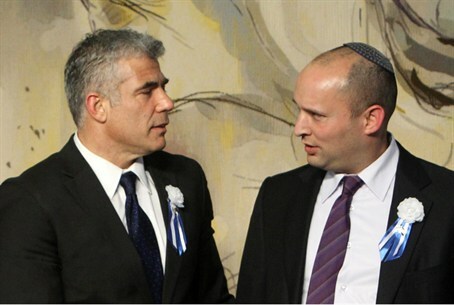 The historic alliance between Yesh Atid and Bayit Yehudi surprised everyone. How did it come about? Senior figures in the religious Zionist Jewish Home (Bayit Yehudi) party are fiercely defending the party from criticism of its agreement with the secularist Yesh Atid, that neither party will enter the coalition without the other. The "gentlemen's agreement" appears set to go down in history as the surprise political move that shaped Binyamin Netanyahu's third government. The senior figures provided Arutz Sheva with a play-by-play account of the events leading up to the "pact." "During the election campaign, in the course of the last months and weeks, we felt ill winds blowing from the Likud, which said that there is no intention to include us in the government. We were expressly told this, from within Netanyahu's office," the senior figures said. "In our distress, we turned to one of the heads of Shas, Aryeh Deri. This plea was made five weeks before the elections, and after the elections as well. We begged for full cooperation, but Deri refused to meet with us. There were countless direct and indirect telephone calls. Deri told us that he had checked with the Prime Minister's Office and was told that that there is no intention of adding Bayit Yehudi to the coalition. 'Bayit Yehudi's place will be in the Opposition,' Deri was told outright by Netanyahu's office." According to the senior Bayit Yehudi figures, Deri and his men told Bayit Yehudi – "Since we were told specifically that Netanyahu has no intention of adding you to the coalition, we have no desire to create a religious bloc with you. What do I gain by an alliance with Bayit Yehudi? That is not my war," Deri said. Two days after the elections, Netanyahu told Deri again that Bayit Yehudi will not be in the government, the senior figures said. "Deri told us, 'I cannot solve your problem vis-à-vis the prime minister,' and since then he has not gotten back to us. Deri basically threw us under a bus. So we had to turn to Yair Lapid. Once the hareidim heard that a 'pact' was formed with Lapid, they asked to meet us. Now they are creating the false picture that we abandoned them. We regret the lies and half-truths that they have been spreading in the last few days. This is the true story." The senior figures deny vehemently that the understandings with Lapid will hurt the Torah world. "There will be no damage to the Torah world. We will not let military police drag yeshiva students from their 'shtenders' [the stands, usually wooden, upon which the books being perused are placed, ed]. We will make sure of that. The Torah world is an eternal and sacred value for us, too." Aryeh Deri's office said in response: "It appears that the Mafdal [the antecedent of the Bayit Yehudi, ed. ]politicians are dealing with an guilty conscience in the last few days, and that, as a desperate defensive step, they are spreading lies. Since the elections, Bennett has not contacted Deri once, the only meeting between them was initiated by Deri, and the idea of a [religious] bloc was not even discussed."